But mounting a nuclear warhead on a ballistic missile is a difficult task. All five members of the “nuclear club” went a long and difficult way from testing a nuclear bomb to mounting it on a missile. It took seven years since the first US nuclear test to mount a 1200 kg nuclear W-5 warhead onto Matador MGM-1 and Regulus-1 cruise missiles, and it took almost nine years to create W-7 warheads for tactical ballistic missiles Honest John M-3 and Corporal. 30 nuclear tests were conducted during this time period. Some of them were conducted in order to improve the mass and size of the bombs. The W-3’s 10,300 pound explosive device was reduced to W-7’s 1645 pound one, with the diameter shrinking from 60 inches to 30 inches respectively. The second important task was adapting the warhead to high speeds and temperatures that happen during ballistic flight. The first Soviet medium-range ballistic missile, the R-5M (SS-3), with a mounted nuclear warhead was tested in February of 1956. The mounted RDS-4 nuclear bomb had a payload of 1,300 kg. By that time the Soviet Union had conducted 10 nuclear tests. China had had four nuclear tests by the time the DF2 medium-ranged ballistic missile was flight tested. Pukguksong-2 (KN-15) is a cold launching solid fuel intermediate-range ballistic missile. It is a ground launched variant of KN-11 SLBM. Its first test flight was on February 12, 2017, despite North Korea testing the KN-11 submarine-launched variant since May 2015. Not much is known about KN-15’s capabilities. In February of 2017 the missile reached an altitude of 550 km and flew a distance of about 500 km, which is almost identical to successful tests of KN-11 in August of 2016. This deformed nonoptimal trajectory give reason to claim that KN-15 i capable of hitting targets in range from 1200 to 2000 km. Solid fuel engine allows for firing the missile right after receiving an order. Such missiles require less auxiliary transport and personnel, which allows its operational flexibility. Currently the only operable ballistic missile in North Korea is KH-02. One of the new things is launching the missile from a transport erector launcher (TEL). This is clearly influenced by Russian technologies. The TEL is made out of thick steel, which allows using the container multiple times. The KN-15 tests are notable because they were conducted by using crawler-tracked launcher platform that looked like old Soviet 2P19 on ISU-152. 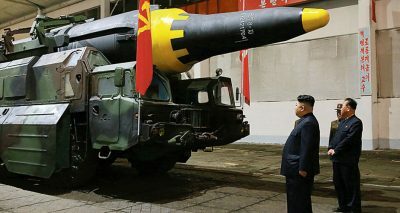 This differentiates KN-15 from other North Korean missile systems, which used wheeled platforms and therefore are limited to roads. Getting the system on crawler-tracks allows for flexibility that is much needed in North Korea, as it only has about 700 km of asphalted roads. The launcher is assumed to be based on T-55 tank. This shows that North Korea is capable of developing launchers on its own since it is unable to buy them from Russia and China due to weapon embargoes. KN-15 was also considered similar to JL-1 and DF-21, which raises the possibility that it was made based on Chinese technology. Their shapes are similar, and the speed of KN-15’s development also raises suspicion. Physical similarities are an unreliable method to discern the origin of a missile, considering overall physical similarities between SLBMs and solid fuel missiles. Featured image is from express-k.kz.